Impressive Kenilworth blew away Dudley at a wet and windy Glasshouse Lane to earn a bonus-point victory, writes Sophie Freestone. The home side started brightly, stealing a Dudley lineout inside the first three minutes. Kenilworth earned a penalty inside their own half and although Josh Hickman missed the long-range kick, the hosts remained on the front foot, penning Dudley back in their own half. After a second missed penalty, Kenilworth’s pressure paid off as they crossed for the opening try of the match. A quick take at a lineout inside Dudley’s 22 found its way to new recruit Josh Fox who dived over the whitewash. Hickman added the conversion and then kicked a penalty to give Kenilworth a ten-point cushion just short of the 20-minute mark. The visitors responded with a penalty of their own before Kenilworth were almost in again thanks to a charge-down from flanker Ollie Burnham inside the Dudley 22. However, it was only a matter of time before Kenilworth extended their lead with Fox adding to his earlier score courtesy of a fine break down the left wing. As the first half drew to a close, Kenilworth continued to press, with Mikkel Andresen making the hard yards down the centre of the pitch. A further sustained period of pressure took Kenilworth deep into the Dudley 22 and a subsequent penalty allowed the quick-thinking Gareth Renowden to feed Andresen for a try close to the posts. The wind pulled the conversion wide but Kenilworth ended the half with a comfortable 20-3 lead. The difficult weather conditions continued for the second half and the visitors’ task was made harder when they had a player yellow-carded for not retreating ten metres. Good attacking play and an excellent run from Andresen resulted in a kickable penalty for Ks, but again the wind dragged the effort wide of the posts. With Dudley restored to 15 men it was then Kenilworth’s turn to play ten minutes short-handed after Ollie Burnham was sent to the sin-bin for using his hands in a ruck. Despite their disadvantage, it was Ks who enjoyed the best of the ten-minute spell. Charlie Preston made a great break up the right only to be penalised for holding on before a knock-on over the line prevented the bonus-point try. 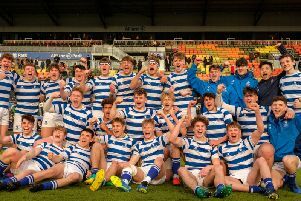 A fourth try did come, however, as Kenilworth won a five-metre scrum and the ball was popped up to captain Bobby Thompson who crossed for the first points of the half in the 70th minute. Hickman converted to put Kenilworth 27-3 up, with two late tries from Dudley making the match look a much tighter affair than it actually was.